Yap Tin Yong Engineering Sdn Bhd is a company that specializes in roof truss construction work. Our main office is located at Batu 18, Jalan Raub, 27300 Benta. The company has been started by Dato' Yap Tin Yong in 2003. 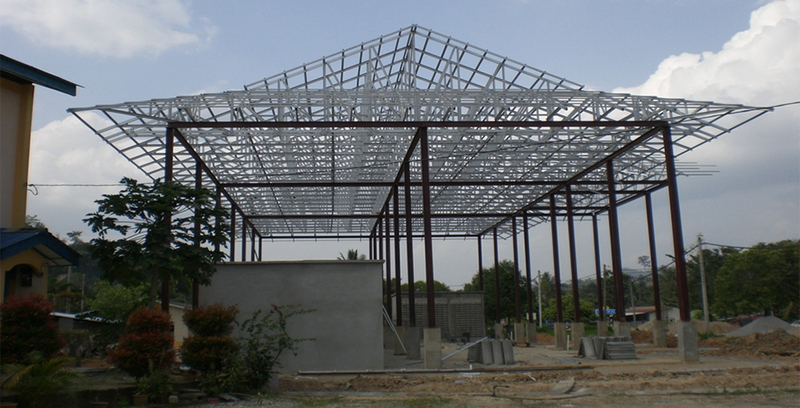 The main business activities are product & service which is design and build roof trusses steel system. The business hour is starting from 8.30 am. until 5.30 pm. for everyday except Sunday and Public Holidays. Cost effective: Producing frames in the factory reduces time and labour on site. Cut to length material reduces in-field cuts waste on site to near zero. Uniform quality: Steel materials are manufactured to strict standards of strength and consistency. Easy to modify: Being that the product is steel; any last minute changes can be done on site. The strength of steel allows greater sweeps of beam and more adventurous design capability. Design flexibility: The strength of steel and superior engineering from Yap Tin Yong Engineering provides excellent spanning capabilities.